On the 21st: If you think that only science, math and history are the keys to success in school, think again. A new study links art and PE to graduation rates. And, a new program from the City of Champaign and the nonprofit C-U at Home is helping put people struggling with homelessness to work. 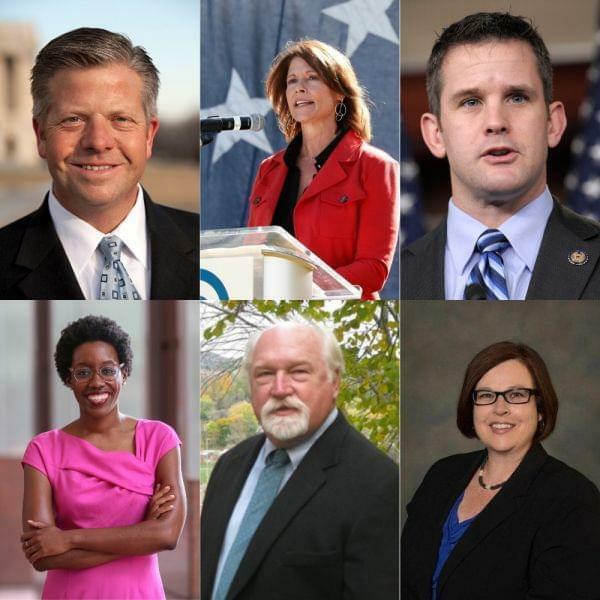 But first, we update you on three congressional races in northern and northwestern Illinois. Throughout the past few weeks, we've been talking about many of the different Congressional campaigns across the state, from the Chicago suburbs to southern Illinois. Last Thursday we hosted a debate for the 13th district, which covers large parts of central Illinois. We’ve got a special podcast of that if you’re interested. A reminder that election day is November 6. The online registration period has ended, but you can register to vote in person anytime including on Election Day. But at this point, if you are registering for the first time in person, you should be prepared to vote when you register. Our friends at the Illinois Newsroom have put together a handy guide for anyone in the state: just enter your address and you’ll get all your information. It’s at ILVotes2018.org. This morning we discussed three more Congressional districts in Northern Illinois. Illinois’ 14th district is a seven-county district including DuPage, Kane, and McHenry counties, represented by Republican Congressman Randy Hultgren. His opponent is democrat Lauren Underwood, she has served as an adviser for President Obama and also has a Ben & Jerry's flavor named after her. Jim Fuller, a senior writer with the Daily Herald, joined us to share his insight on the competitive race between them. We also talked about the Congressional race in the 16th district, which includes parts of the city of Rockford, large portions of north-central Illinois and then also goes east to the area just south of Kankakee. Incumbent Congressman Adam Kinzinger, a Republican, is facing a challenge from democrat Sara Dady, an immigration attorney from Rockford. Sue Stephens is a reporter for WNIJ. She joined us on the line with to tell us more about that race. We also discussed the competition between the candidates in the 17th district which it includes the Quad Cities, Galesburg, and parts of Peoria. Cheri Bustos, the only Democratic Representative outside of Chicago, is running against Republican Bill Fawell. Herb Trix, the news director for WVIK in Rock Island, joined us over the line to provide an update on their race. #ElectionDay2018 is November 6. You can register to vote in person ANYTIME including on Election Day. If you have kids in school, what are the subjects you would be most concerned about? Is it English? Or maybe math or chemistry? Either way, you probably did not think about gym class. According to a new study from the University of Chicago Consortium on School Research, failing a class like PE or art in freshman year could be just as damaging to a student’s chance of graduating as subjects like English, math, and science. Jenny Nagaoka is the study’s author and the consortium’s deputy director. She was with us to talk over her findings in the study. Michael Jon Skura was also on the line with us from Oswego High School where he’s the Chair of the Fine Arts Department. He’s also the Advocacy Advisor with the Illinois Art Education Association. And Mark Foellmer joined us as well. Mark is the incoming President of the Illinois Association for Health, Physical Education, Recreation & Dance. On a single night in January 2017, there were more than 10,000 people here in Illinois experiencing homelessness. And, for those struggling with homelessness, getting and keeping a stable job can be extremely difficult. We discussed a new partnership between the City of Champaign and the non-profit C-U at Home which is helping provide jobs for people who are homeless. Andrew Quarnstrom joined us in at our studios to tell us more about the program. He’s supervisor for the CIty of Champaign Township. And Rob Dalhaus, the executive director of CU at Home, was also with us to talk about the program. Inspired by a Ted Talk, @ajqstrom of @cctownship reached out to @C_UatHome to start a new partnership to provide jobs to the homeless.